When I started bodybuilding back in the early eighties, I thought a set of weights, an adjustable bench and maybe a pulley on the rafters for a makeshift lat machine was all I would need for a home gym. To a large extent, I was right. I made great progress as a beginner lifting weights with little more than those basic things. At that time, I did not even know what a power rack was or why I would need one. Now I have what I believe is the best power rack home gym for most people. As my experience grew and my muscles began to respond, I realized that lifting heavy weights at home, most of the time by myself, was getting to be a bit risky, especially when performing bench presses and squats. I decided I needed a power rack. A power rack provides a safe and versatile workout platform which quickly became the “heart” of my home gym. If I were to start another garage or basement gym, I would start with a power rack. You can start a home basement or garage gym with just a few essential pieces of equipment. You will need a set of weights, a bench, and some adjustable dumbbells. This will be sufficient for beginners. Most beginners are not lifting weights that are so heavy that you can get into trouble. If you have a workout partner, you are able to “spot” each other which remove a lot of safety issues. If you are going to be working out alone, a power rack is the one piece of home gym equipment I would not be without! This video shows me performing just a few of my favorite exercises using my power rack with lat pull down attachment. There are a lot of different pieces of equipment you can get for your basement weight room but if you’re just starting build a gym, I highly recommend making a power rack an essential part of it. I have had a basement home gym for over 20 years and it gets a lot of use. When I only had a bench and barbell, I quickly found that I was limiting myself on the bench press because I was concerned about getting stuck under a weight at the end of a set. So I was forced to stop my sets a rep or two before true muscular failure occurred. 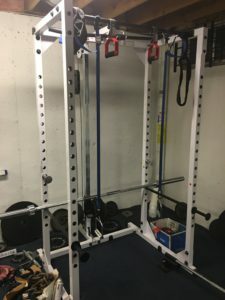 Why do I Need a Power Rack? This is the number one reason I bought my Powerline Power Rack. Since I primarily work out alone, I needed a way to push my intensity to the next level but I was worried about getting pinned under a heavy barbell at the end of a brutal set. A properly set up power rack solves this problem with the safety bars. You can push your set to the max and when you can’t budge the bar anymore, you just allow the safety bars to “catch” the barbell and you can easily slide out from underneath. The power rack can be used for numerous exercises, and other attachments can be added to make even more exercises possible. If you look at the picture, you will notice that I use my power rack for many exercises. I have homemade TRX style suspension straps, Perfect Abs straps, Fat Gripz, and pull up handles all hanging on the pull-up bar. A power rack is not complicated. It is simple to put together, simple to use and simple to add accessories to expand its capabilities to help you build muscle. If you are bench pressing on a conventional bench, simply move the bench into the power rack, set the safety bars at the right level, and off you go. You will no longer need stop your set if you are unsure you can complete the next rep. If you can’t get that last rep, simply lower the weight to the safety bars and slide out. No problem. I recommend a power rack that has an optional lat pull down attachment if you do not already have one. This accessory will allow you to do lat pull downs, triceps push downs, low cable rows, upright cable rows, bicep cable curls, etc. Lat attachments are available as “plate load” and ‘weight stack” versions. Plate load is less expensive, as it just comes with a carriage that you load barbell plates of your desired weight on to the pins. The weight stack models come with a selectable stack of weights similar to a commercial gym lat machine. There are a lot of different power racks available and we will look at some of them here. The rack that I have is a fairly basic unit made by Powerline and it has served me well for over 20 years. I am not breaking any weightlifting records so this basic unit is plenty for me. You can spend more money and purchase a more heavy-duty unit if you’re going to be bench pressing 500+ pounds or dead lifting off of the safety pins upwards of 500 pounds. When I purchased mine I also chose the optional lat pull down attachment. This turned out to be a useful option that I use very frequently for lat pull downs, triceps press downs, low cable rows, and I even use the low cable pulley to do biceps curls. The chin up bar is perfect for chin-ups of course, but I also use it to mount my homemade TRX suspension training straps, and my ab supports to do leg raises. Another nice option I have added or pull up handles that allow you to turn your grip to different angles which has helped me greatly when I was suffering from tennis elbow. Body Solid also makes an attachment to add a T-bar row exercise to your power rack. You will need a spare barbell bar and T-Bar handle as well. There are many other power racks out there, I recommend this one because I have had it since 1998 and it has held up without any issues whatsoever, and survived disassembly and reassembly when I moved 18 years ago. The finish is still in excellent condition, and the lat attachment still performs flawlessly. The company that makes it, Body Solid, is still one of the most respected companies in the home fitness market. Few years ago I always walked down to the gym but I didn’t have my own personal gym by then. I used to be very addicted to power rack in such a way that I can’t just rest for the day without walking down the gym. The power rack I used then was a locally constructed one but I think I still need better power racks for myself. Kenechi, thank you for reading and commenting on my power rack article. There are all kinds of great racks out there, especially in some of the local gyms. They are usually very heavy duty but the one I have is just right for me even though it does handle 600 pounds if necessary LOL. Wow, great article on the best power rack home gym equipment. I particularly appreciate the fact you’ve expl;ained that they are easy to put together. Also having the capability to add accessories to to boost it’s capabilities it a bonus that will benefit many. Great post, I’ll check your recomendations. Thank for stopping by, Nigel! It is truly a simple, yet versatile piece of equipment for a home gym. I have been wanting to train my muscles. I tried being consistent with the gym but that never worked. I prefer doing my exercises at home and the only thing I did at home which I call exercise is push up. I tried lifting weights in the gym but didn’t find it safe and I gave up. I like the idea of the power rack. It can be used at ho, me and it just can occupy single space. It a very safe equipment tool. Promise Joshua, thanks for the comment on my Best Power Rack post! Indeed a power rack is a great way to start a home gym! It is the single best investment I have made for my fitness goals. The power rack gym is my best workout tool for daily fitness. Its safety features and accessories with different exercise options makes it a befitting one for adding muscle, especially for beginners that want to pick up fitness skills gradually and build muscle. It will be my dream to acquire one to boost my commitment to gym. Chris, thanks for reading and commenting on my power rack article! If you get a power rack, you will be excited to start using it! Lots of great exercises can be done with this versatile piece of equipment! Hey Dave, thank you for the work out tips. If I ever decide to build a home gym, I will definitely invest in a Power Rack. For now, I have been working out at Planet Fitness and only using machines. As you more than likely know, I am probably not getting the most effective workout that way. There are racks there, but for some reason, I do not take advantage of them. In fact, I never have, but I could see myself using one in the comfort of my own home. This way I could actually learn how to use it, which is probably the biggest issue. The Power Rack would certainly pay for itself over time and eventually elliminate the club fees, in addition to building strenghth more efficiently. Thanks again, Dave, I now know where to go when I decide to go with a Power Rack! NathanG, thanks for the comment and insight! I know that one of the reasons a lot of people (including myself when I first started out) don’t use certain equipment is simply because they are not familiar with it. I can also tell you that most guys at the gym would be very happy to help someone out that asks them a question! When i was starting out, I went to a gym full of massive bodybuilders and i was maybe 19. One day a guy just came up to me and gave me a few pointers on a piece of equipment I was trying to use and i will never forget that! Since sport is also my niche, I am glad to comment on your blog post. There are many ways hot go gain power and more muscles mass. by adding external weight to your workout routine you are on the best way to gain more muscle mass if you know how to train the hypertrophy. If the hypertrophy is the goal. The most important thing in any workout is safety and health.Having on hand proper equipment will prevent injuries. Any kind of machines, stands, frames etc. can help to avoid such mistakes and get injured.Power rack is also one of those, between many others. It is a great tool that almost anyone can use it. But, as mentioned, regardless of what tools and equipment you use, the ultimate goal is to train safely and healthy! The injured body can’t practice as you want. So learn, properly the exercises, how to use the machines and equipment of all kind, train according to your age age and fitness level, train regularly, and rest well. The result will come!Stay well, market better, convert best! Igor, thanks for reading and commenting on my article about power racks! I appreciate your input on health and fitness! Just like you said a lot has changed between then and now, there are lots of new technology and innovation applicable to all walks of life, This assertion Is even more evident in the sport and bodybuilding industry. there is no doubt about the importance a the power rack for home gym use, however, I am a bit concerned about the place of an instructor in guiding the use of this equipment for optimum results, what are the impacts of using this equipment wrongly. Zuchii, thank you for commenting on my power rack article! I believe a power rack is one of the most useful pieces of equipment for a home gym. Certainly a professional trainer and commercial gym is the best way to go, so this equipment is for those that cannot afford that route, or just prefer to work out at home! I have found very powerfull insights. I realy liked how you based on your passion to create this website. I myself combine cycling with bodybuilding and they can workout together when the drive is there. I admire your lust for life, it’s an inspiration. I personally know many people over the age of 45, who have more or less given up their own lives.The respect we have towards our body will help us maintain our health. Raluca, thanks for reading my article and leaving a comment. Yes, the older we get, the more important it is to remain strong and healthy!